Frank Miller | Ty Templeton's ART LAND!! Ooh, look at the big shot, so BUSY with work. So…the Bun Toon had to be drawn in Stick Figure form this week, just to save time. Of course, with the idea being that this was supposed to SAVE me time, the Jack Kirby and Frank Miller mock-ups took me EXACTLY as long as most Bun Toons do….sigh. 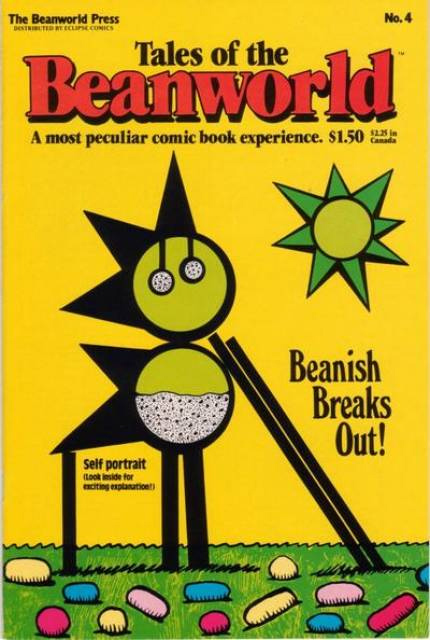 Larry Marder’s Beanworld has been flying the Stick Figure Freak Flag since the 80s! For The Bun Toon Archive, click the happy singing pastry. The Robins Get Rounder Bun Toons! YAY! You’ve read this far. It’s too late! You know, they re-introduced VIBE into the DCU without making it terrible, so let’s cross our fingers for this newest addition to the child-care nightmare that is Wayne Manor. 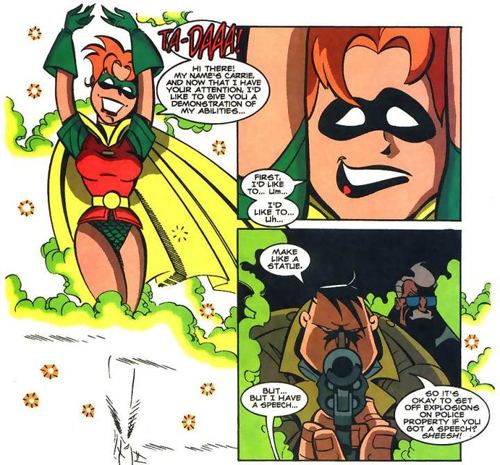 Rick Burchett and your humble blogger introduced Carrie into the DCAU fairly early in the series, but only to be arrested in the very next panel. For the BUN TOON ARCHIVE, going back more than two years, click the proud rabbit. Number #1 Bun Toon of the YEAR! (And the bestest failure, too)YAY! And now, that day has come, and so we face, the final curtain… on 2011. (Above is a MUCH cleaner copy than the one that went online originally). A few people pointed out that Frank looked more like he was auto-fellating himself than inserting his skull into his bowels in my cartoon, which is a fair point anatomically, but moot satirically. I’m good with his depiction either way. My last line up there… “I used to love you, Frank.”…you don’t know how true that is, ladies and gents. Watching Frank Miller turn into the current version of himself is like watching a beloved Uncle pee on the shrubs at a wedding. And I mean the front shrubs, in the yard that faces the road. At the Church. Without undoing his fly first so it goes all down his pant leg and everything. Cut it out, Frank, and find a rest room. A contribution I did for Gail Simone's "You'll All Be Sorry" column from a couple of years ago. That Frank Miller strip up there took me less than an hour – from idea to putting it online where it was read by tens of thousands of people, we’re talking maybe 45 minutes (you probably noticed Frank never moves, and there’s no backgrounds either, two tricks of the lazy cartoonist!). But the Bun Toon below took more than six or seven hours, by far the longest I’ve ever spent on one. It was done mostly in lieu of sleep over a couple of nights, and it was maybe the most fun I had on a webcomic entry so far. The poor thing did no traffic when it went up though, and has stayed at the bottom of the hit parade ever since. Lesson learned: Effort is for squares. Just whip it off, baby, and you’ll get your reward. NOTE: The premise here, explained in the original post, was that I was privy to some inside information about the next six comic book movies coming out of Big Time Hollywood because I was working on one of them, doing storyboards. I can now reveal which film I was storyboarding for release in 2012. 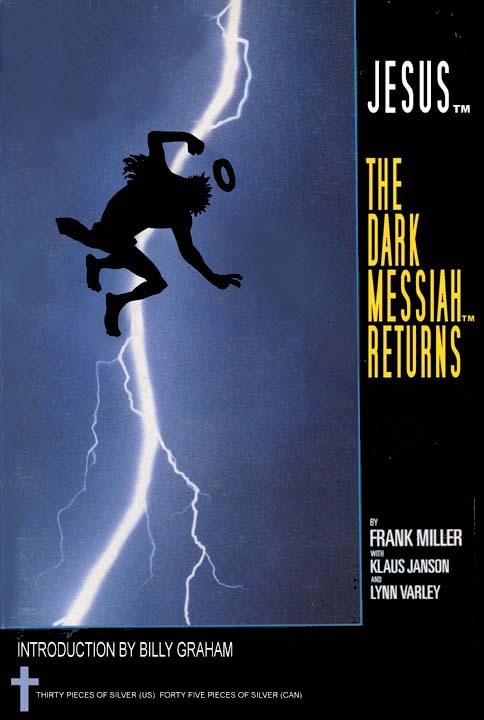 It’s the Christian Bale Thunderstrike picture. Look for it in local theatres in the coming year. That’s it for 2011, bunny people. Come by in 2012 and I promise we’ll be just as lightweight and meaningless, only better. Special Bonus Frank Miller Bun Toons Extra! YAY! YAY! Because it's a Sunday, I spend eight minutes adjusting the logo! I didn’t even mention that SPIRIT movie. I spared us all that. If you need to be disappointed in the once-great Frank Miller, go HERE to read his spittle flinging rant against OWS. For YESTERDAY'S Bun Toon, click the title above. For Every Bun Toon ever, click the long eared rodent above.